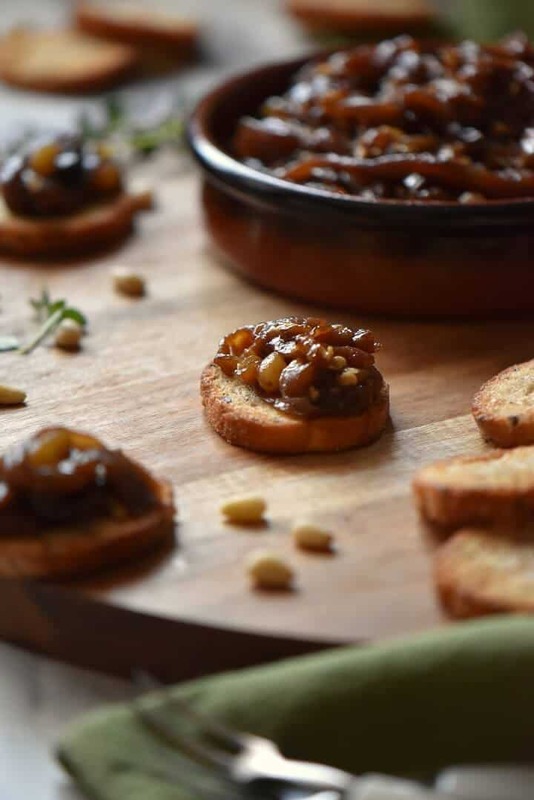 Home » Appetizers » Eggplant Caponata-A Roasted Version! 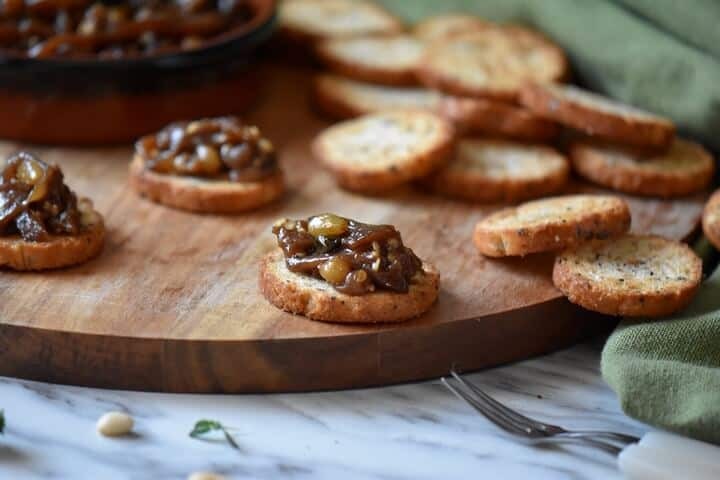 This recipe for Eggplant Caponata is a delicious, non-traditional Italian appetizer made with roasted eggplant, olive oil, honey, balsamic vinegar, pine nuts and capers. Lina’s Baked Eggplant Caponata provides a different take on the Sicilian classic -simultaneously sweet and sour, with just one bite, you’re hooked! This post was originally published on June 28, 2015 and republished on June 9, 2018 with updated content and photos. Consider for a moment the versatility of the eggplant. Grilled, roasted, broiled, baked, stir-fried, stewed, stuffed, fried, or even pureed; there’s a reason why the eggplant is so widely used in Asian, Middle Eastern and Mediterranean cuisines. I am positive that as far as Italian cuisine is concerned, one of the most popular eggplant dishes is melanzane alla parmigiana or eggplant Parmesan. I’ll be sure to post my mom’s recipe soon. But for now, I’d like to sing the praises of this Baked Eggplant Caponata which is simultaneously sweet and savory and makes one of the best eggplant appetizers I know! Not to mention that it is also delicious snuggled into sandwiches! Truth be told, if I had to choose between having one main dish or just grazing my way through a few appetizers, I would definitely choose appetizers. Simple and tasty appetizers like these Italian Marinated Mushrooms, Orange Marinated Olives, Roasted Bell Pepper Goat Cheese Bites and the ever popular Tomato Basil Bruschetta (which includes my tips and tricks) are truly crowd pleasers whether serving them as appetizers or part of your cheeseboard. Oh, I almost forgot to include my Lupini! If you’re Italian, you know you have to have lupini. 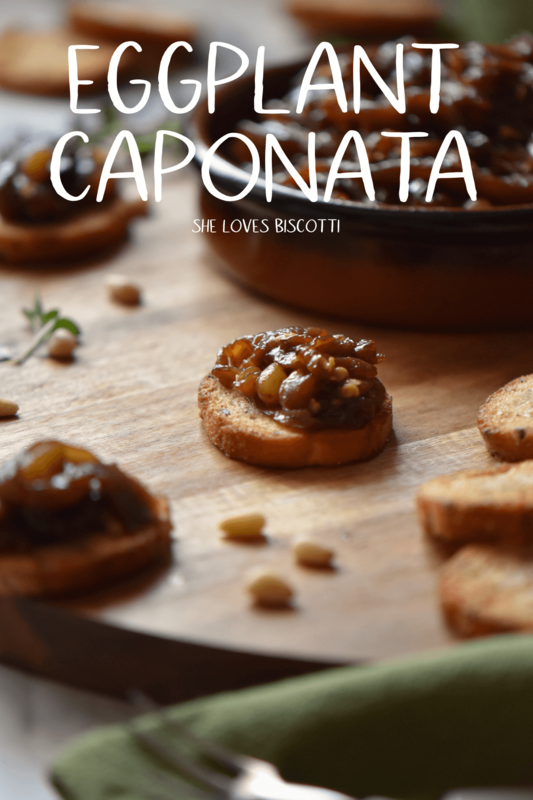 This easy caponata recipe is definitely one that I will be adding to my repertoire of vegetarian appetizers. Why love this Eggplant Caponata recipe? It is versatile enough to be used in burgers, sandwiches, as a pasta topping, as a vegetable side with grilled meats or chicken. There are very few Italian eggplant recipes that can easily elicit an OMG feeling from the very first bite. One such recipe is this roasted eggplant caponata and you won’t believe how easy it is to make! The first thing we need to do is to thoroughly rinse and dry the eggplant. Then, with a very sharp knife, remove both ends. 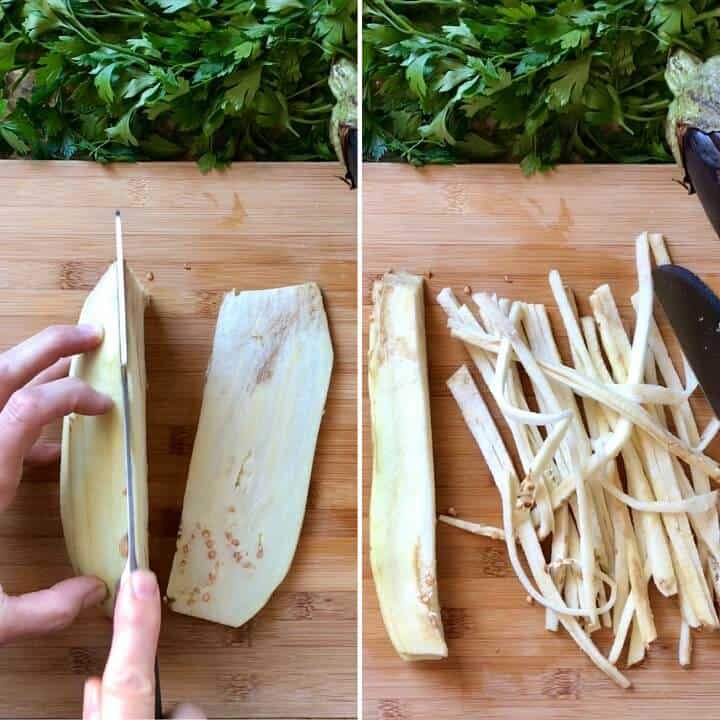 With the help of a vegetable peeler, begin to peel the eggplant lengthwise. Once the outer peel has been removed, cut lengthwise and then into 1/4 ” thick strips. 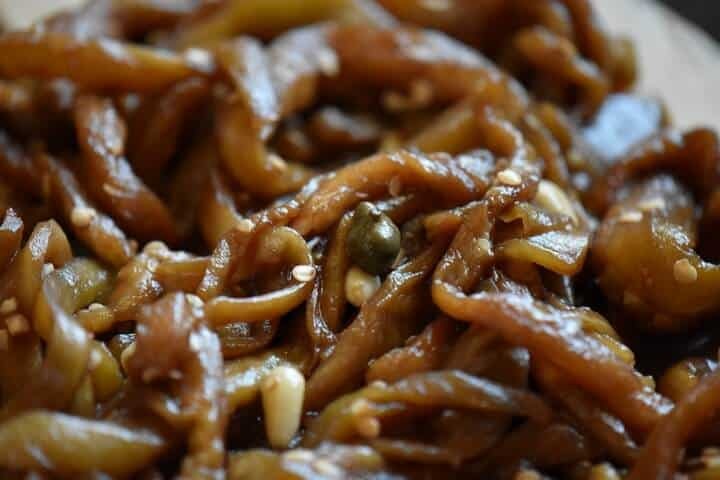 Place the eggplant strips in a bowl and toss with about one teaspoon of salt. Transfer to a colander set over the bowl and allow to sit for about one hour. Meanwhile, whisk together the olive oil, honey and balsamic vinegar. Mix in the capers and pine nuts and set aside. When the eggplant is ready, gently squeeze the eggplant to remove the excess liquid. Combine the eggplant with the mixture and place in a baking dish. Cover and bake for about 45-60 minutes in a 350° F oven. This mixture should be stirred every 10 minutes or so. Once the eggplant have softened, remove the cover and continue to bake for about 15 minutes, this will allow a little browning. You will notice that this eggplant caponata cooks down almost to a compote consistency. Once the roasting is complete, remove from the oven and allow to cool down completely. Although it can be used immediately, the flavors intensify if allowed an overnight stay in the fridge. In fact, the longer this caponata sits the better the taste. See, I told you that this was easy. As I mentioned, it’s just perfect on a toasted baguette, on pasta, in a sandwich or snuggled in a homemade piadina… I’ve also eaten it alongside grilled fish. Versatility and simplicity at its best! You might be wondering, who is Lina? Well, Lina is my beautiful little sister. I cannot even begin to sing her praises. Suffice to say that I have nothing but respect and total admiration for this wonderful person who happens to be my sister…how lucky am I? Okay, enough family business and back to the real business of food. 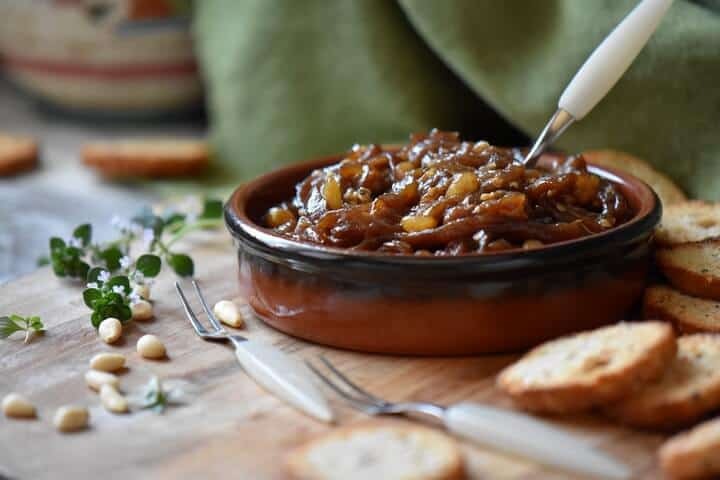 As I was saying, I tasted this Eggplant Caponata at our recent get-together and I thought this was such an amazing recipe that I just had to share it with all of you. By the way, if you are looking for the classic Sicilian caponata with tomatoes and celery, head on over to The Petite Cook. 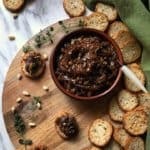 ★★★★★ If you have made this Eggplant Caponata recipe, I would love to hear about it in the comments below and be sure to rate the recipe! 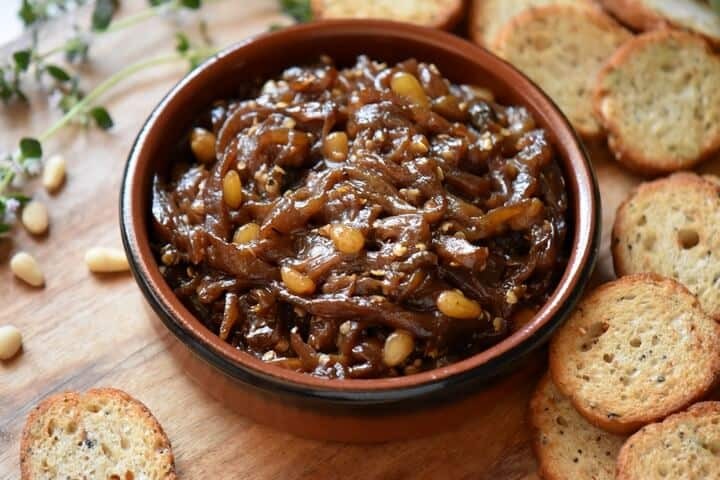 This recipe for Eggplant Caponata is a delicious, non-traditional Italian appetizer made with roasted eggplant, olive oil, honey, balsamic vinegar, pine nuts and capers. Lina's Baked Eggplant Caponata provides a different take on the Sicilian classic -simultaneously sweet and sour; with just one bite, you're hooked! Remove outer peel from eggplant. Sprinkle eggplant strips with salt. Toss together. Transfer to colander set over a large bowl and let drain for about 1 hour. In the meanwhile, whisk together equal parts of olive oil, honey and balsamic vinegar. Add capers and pine nuts and set aside. Try to squeeze as much as the liquid as possible from the eggplant. In a baking dish combine the eggplant and the mixture. Cover dish and bake at 350 ° F for about 45-60 minutes or until the eggplant is soft (stir mixture every 10 minutes or so). Remove cover and continue to bake for approximately 15-20 minutes. The recipe will make about 2 cups of caponata. Can be eaten as an appetizer on a toasted slice of baguette. It's great on pasta, in a sandwich or wrap... or even alongside a steak. Feel free to add garlic, olives, even cherry tomatoes...make it your own and enjoy, like my sister did! DO YOU LOVE THIS EGGPLANT CAPONATA RECIPE? I tried this recipe today and it was delicious! It had just the right amount of sweetness and reminded me of a caponata I had in Vicenza in April that I’ve been dreaming about. It was easy to make and is a definite keeper. Thank you! Maria, I love trying new eggplant recipes and this looks like good one and so easy! I have a couple of eggplants ready on the bush in the garden so guess what’s on the menu tonight? Love the idea of roasting the eggplant rather than frying, to be perfectly honest the thought of frying often keeps me away from this amazing & versatile dish. My favorite way to enjoy caponata – definitely as a pasta topping. What a delicious looking appetizer! The flavours look amazing! It’s always nice to get a new idea for starters such as this. Thank you for sharing it. It was love at first bite for me and this eggplant caponata. Hope you like it Denise! I know just the occasion to try this! What a wonderful way to set the tone for a meal or maybe for a relaxing evening on the patio. Yes to all of your tasty appetizers!! Me too, I’d rather eat appetizers (and dessert) than a whole meal 🙂 . I am an eggplant lover and a caponata lover. My ex parents in law were from Sicily and I enjoyed quite a few caponata. Love how the eggplant here is cut lengthwise and the sweet and savory flavor is great! Pass me a few of those pieces of bread with the caponata, I’m getting hungry!! Truly a masterpiece ! Perfect for slow food gatherings ! Grazie milla ! Love eggplant and this caponata looks amazing! I am going to have to try this while eggplants are in season!!! Hi Justine, we share a common love for eggplant! Let me know what you think…appreciate the comment.